Sourdough Bread: Day Two (very, very long) | carpe diem! 1-2tsp table salt I use 1 heaped tsp, which gives a very mild bread. If you’re accustomed to commercial loaves, try 2 tsp. 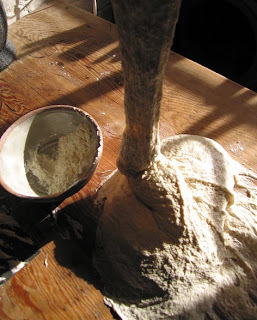 but don’t add everything all at once to the incipient dough; hold back some flour and at least a third of the water. Have your dough scraper to hand: this is going to get very messy. If you’re going to use a mixer you’ll have to judge the results by eye from the pictures. 1020. Note the flour held back to flour the work surface, and the remaining water. 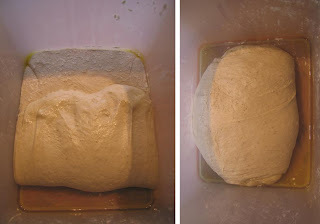 This is a trick for working wet doughs by hand: to start, add only enough water to make a dough you can manage. 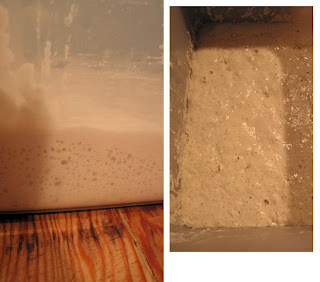 As you knead and time passes, the gluten develops, the dough stiffens a bit, you can add the rest of the water gradually. You’ll still be kneading chewing gum, but it’ll be slightly stiffer chewing gum. I rather suspect you could throw this dough into the ‘No Knead’ bread recipe to rise at this stage, but I haven’t tried it. 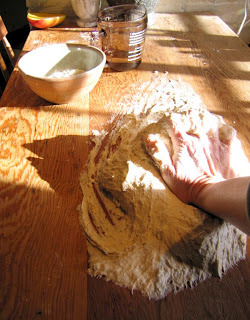 I knead this by driving my hand from the wrist into the dough and pushing it away across the table, then scraping it back as I bring my hand/arm back. 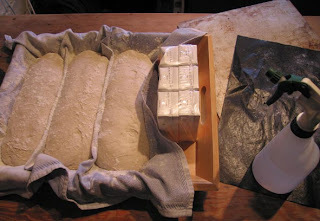 The power comes direct from the shoulder, and it’s a good method for working wet doughs. I rely on the dough scraper to bring the dough back together when it seems to be flowing away from me; I can’t imagine manually working a dough like this without that scraper. At some point you may want to take a break from all this. 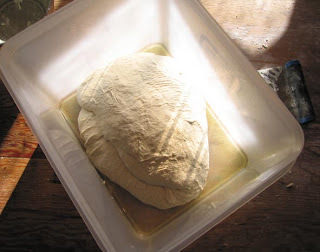 When you do, prepare the container to hold the dough while it rises by pouring in 1-2 tablespoons of olive oil and smearing that thoroughly over the bottom and up the sides a bit. 1024. I’ve added some water, pooled into a hollow in the dough. I’ll puddle this into the dough with my fingers before starting to knead again. 1040. See what I mean? The dough is like chewing gum, but even softer. With practice you’ll find it easier to work this stuff and it makes really interesting bread. 1043. This looks bearable. 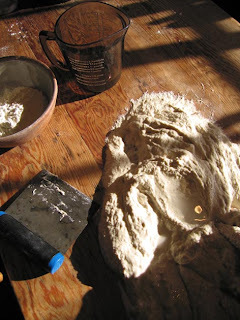 Remember that gluten development continues (albeit more slowly) as the dough is left to rise. Sprinkle the last of the reserved flour (or a little from the bag if you need it) on the table and use the scraper and your hand to shape it into a soggy lump. 1044. Leave it to rise (you did remember to prepare the container, didn’t you?). 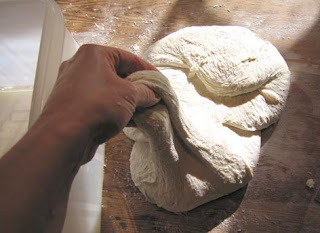 Plan to come back in an hour or so exercise the dough with a ‘stretch and fold’. 1224. Look, bubbles! It’s rising nicely, and see how it’s spread. 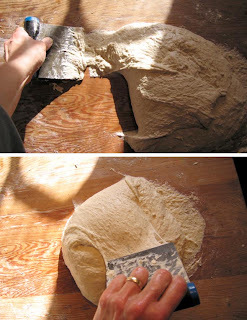 The point of the ‘stretch and fold’ is to improve the dough structure by encouraging gluten development and trapping a bit of air. 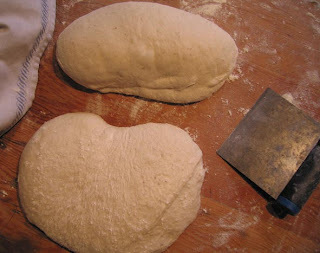 Handle the dough as gently as possible to retain as many of the gas bubbles as possible. NEVER punch or knead the dough. Now, sprinkle a little flour on the dough surface, then work your hands carefully down one side of the container. GENTLY lift that side of the dough a bit, pulling it away a bit, then folding it down onto the surface of the rest. Repeat for the other end and possibly the other sides. 1227. I overdid it a bit. If you look closely you may see a ‘tear’ in the smooth surface of the dough on the right. Leave this to rise again. In very cold weather I am able to repeat the ‘stretch and fold’ an hour or so later, but this dough is working too quickly for that. 1339. 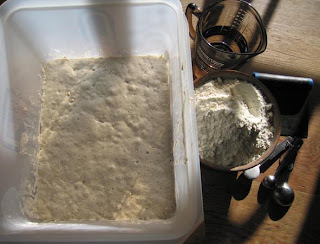 I have very carefully eased the dough out of the container and onto the floured work surface. Don’t knead it! I’ve used the dough scraper to cut cleanly (no sawing back and forth, just straight down) and divide the dough into three pieces. The top one is being shaped: I’ve folded two sides gently into the middle, then folded one of the long sides over this and sealed it. Note that you can still see large air bubbles in the dough; I’m being very, very gentle indeed. Practice makes perfect in this as most other things. The best book I’ve found to describe the shaping techniques (and much more besides) is Reinhart’s ‘The Bread Baker’s Apprentice‘. You can put these loaves into standard tins, but I prefer to bake them directly on a baking stone. The direct heat gives a better initial rise and I love the irregularities of the finished loaves. So. I take our large wooden tray and line it with a linen teatowel (use a smooth surface fabric to reduce sticking) large enough to drape over the sides of the tray and with length to spare. Flour it very thoroughly indeed — always use high protein bread flour for this sort of thing, even if working with rye breads: it sticks less than others. 1340. Put the first loaf at one end of the tray, seam side up. 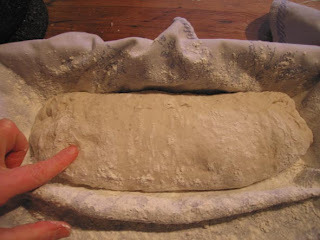 Ruck up some well-floured towel as a divider between this and the next loaf. When in doubt, flour more. 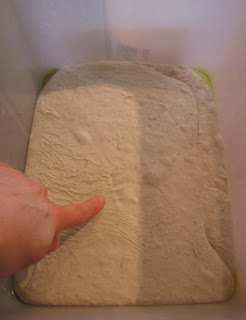 I’ve made some indentations with my finger to show that this is a relatively flabby loaf, but then it’s a soft dough. 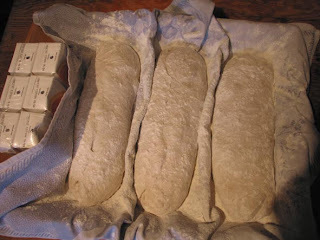 Shape two more loaves and put them in similar hollows in the towel. The tray is just a bit too long; the juice cartons make a useful false end. Drape a sheet of plastic (to prevent the surface drying out too much, although some drying helps the loaves hold their shape) and a cloth (to keep them warm) and leave to rise. If you leave them somewhere warm they’ll rise faster than otherwise. I leave them at least a couple of hours. Turn the oven on at least an hour before you think you’ll need it. I bake at 250C, which is a little more than 480F. If I could get more heat, I would: lean breads like these (no added fat, no sugar or egg, things that burn easily) do best at very high temperatures. If you’ve got a baking stone or are improvising with tiles, make sure it/they are in the oven from cold. You’ll also need a shallow baking tray to hold boiling water on the bottom of the oven (not shown), and a plant mister or equivalent that has only ever held plain, clean drinking water. Don’t start this bit until the oven is ready with the baking stone (if you’re using it) or a baking sheet hot on the bottom shelf of the oven. The oven should have been at temperature for at least 15 minutes. To the right you can see an aluminum baking sheet. I’ll use this as a peel, to slide the loaves onto the hot baking stone in the oven. On top of that is a sheet of teflon cooking stuff. This or any other non-stick sheet makes life so much easier than flouring/semolina-ing a peel to which the bread sticks anyway. Especially when I have to pack the loaves tightly. On top of the stove, out of sight, is a shallow baking pan. The kettle is on and will shortly boil. The next bit is tricky, and requires two hands so I have no photos; I’ll describe it exactly as I do it. You might want to try a dry run when no one’s watching. Put the juice cartons away. Clear the table of everything bar the teflon sheet. I brace the back edge of the tray (with no bread) against my waist to hold it up at an angle with the front edge (where the first loaf awaits) about 2/3 of the way across the teflon. You’ll need both hands to gently ease the part of the floured towel with the first loaf on it up, almost out of the tray and then gently! slowly! move your hands under the loaf/towel and flip the loaf to land seam side down on the 1/3 of the teflon that awaits it. With experience and luck it will only deflate a little with the shock. Shuffle the next loaf up, back the tray a bit, repeat onto the next third of the teflon. And then the third loaf. You might have to ease the towel off the base of the loaves. It might even rip the base of the loaves (more flour next time), but don’t worry: you’re making rustic bread. 1634. 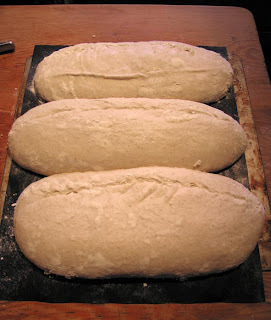 The three loaves on the teflon sheet, which is sitting on the baking sheet/peel. That’s not the seam showing; I’ve put an edge on my sharpest knife and scored the tops of the loaves, holding the knife at an angle to cut under the top of the loaf. This cut allows controlled expansion of the loaf as it rises in the oven (as opposed to a loaf exploding at some random point of weakness). Mist the loaves, taking care to ensure that the cut surfaces are wet. Now. The next bit isn’t tricky and should be done as quickly as possibly, BUT please be careful. Be especially wary of steam: hot steam can scald you very badly. Reinhart suggests putting a (non-meltable!) towel over the oven door as you do this bit, to prevent water cracking the glass. Put the peel-equivalent with bread on teflon sheet near the oven, have the kettle of just-boiled water and your oven gloves nearby. Put the shallow baking pan on the bottom of the oven. Pull out the oven shelf. Slide the bread/teflon sheet off the peel and onto the baking stone. I often have to grab an oven glove and reposition the bread quickly, as one side or the other starts to fall off the stone. Push the oven shelf back. Put your oven gloves on. Pull the baking pan out just far enough that you can CAREFULLY pour about a cup of hot water into the pan; hold your face and hands away as dangerously hot steam will billow when you do this. That steam is needed to give the bread a nice crust: push the pan back into the oven as quickly as you safely can. Shut the oven door. Catch your breath; relax. Set the oven timer for 25 minutes. 1636. Several things. First, you can see my bake stone (a slab of kiln shelf cut to fit an oven shelf). 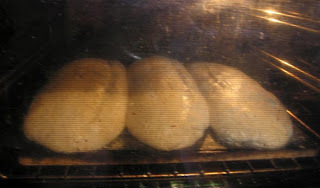 Next, it’s only been 2 minutes, but look at the rounded base of the loaves on the stone: they’re cooking and rising rapidly. The cuts are already beginning to open, too. Note the sheen on the loaves, a sign that the oven is nicely moist. The moisture keeps the surface of the loaves flexible, allowing better oven spring, and a shiny crust is desirable. Keep it moist: every 3-4 minutes for the first 10 minutes, I open the oven door, quickly spray the side and back walls of the oven with water from the plant mister, then shut the door. After about 15 minutes the moisture is not longer needed. 1752. The loaves are cool enough to cut, just in time to have warm bread with dinner. All these images click for bigger, but it’s probably a good idea to do that and look at the sliced surface. Can you see the glossy, translucent crumb and open, uneven structure characteristic of a bread made with wet dough? 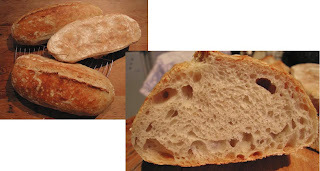 The sense of movement as the gas bubbles expand up away from the hot base of the loaf? I’m a bit annoyed, though. This turned out to be the *least* hole-y section of any loaf (holes are regarded as desirable here). Alas, all evidence of this has been eaten. I hope this proves helpful. It’s not the only way to bake bread like this; it works well for me, but you may find various changes suit your flour or your lifestyle. This entry was posted in Uncategorized on March 9, 2007 by sarahw. amazing. looks so delicious, I could cut a slice!